One of the first thing people ask me since living here, do you speak Spanish fluently. My answer is always no; But I speak Spanglish fluently. Spanglish is a mix of English and Spanish, in either mixed speech or mixing English words with Spanish conjugation. It’s having an interchanging conversation in both languages. Although I have been speaking Spanglish for at least the last 11years of my life, its in no way sufficient to surviving in my Grad program without additional assistance. I was very confident in my comprehension skills but when you end up only understanding 80% of the class the last 20% makes all the difference. I am currently getting an advance intensive course just so I can feel a bit more comfortable in my speech. 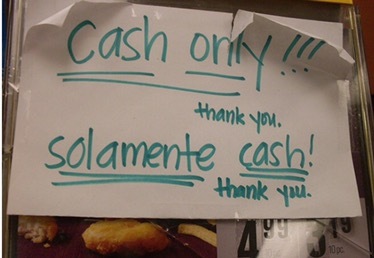 The way the brain works of someone who speaks Spanglish is very confusing. My thoughts are in English. When I’m reading in spanish the words are going through my head in English, it’s an automatic translation, that’s my native language and what I’m most comfortable with. 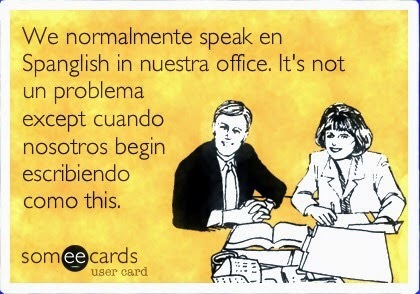 Same with speaking, I don’t necessarily have to think of what I’m saying first or going to say when speaking in Spanish. Pero when people speak to me en Español I usually interpret it as English in my head. A common question is how do I write my notes or write in general, in which language. Honestly in both. I go with whichever word either comes to me first or whichever word is shorter. In the USA/ Latin America, I get by with Spanglish. I’m understood and usually in more places than not (probably without them even realizing it) they’ve adopted some Spanglish terms in their own dialogue. In Spain though not quite… It’s bad enough specifically in Barcelona their language is both Spanish and Catalan, but they don’t even call ‘Spanish’ Spanish here. It’s called Castellano, which essentially is Spanish, but more specifically European Spanish, or the “pure” Spanish. So the tale old question (usually from people who do not speak another language) is why not just learn the right way to speak the language? Are only the lazy people who speak a mix? Simple answer NO not lazy, bit more complex answer comfort. Spanish-English mix isn’t the only language, I’m sure there’s an Italian version, a French version, etc. Imagine growing up in a household speaking one language, but being in a country that speaks another. You’re constantly speaking both, probably directly after the other. It gets confusing for you and your brain, it ends up just making sense to combine the two. The movie Spanglish (available on Netflix and a great movie by the way). They depict a great picture of how life is for A) a native Spanish speaker in America B) a child born in America to a spanish speaking parent C) an english speaking person trying to constantly communicate with a spanish speaking person. In the film you see various forms of Spanglish. Also in the movie Tortilla Soup there is a great depiction of a mexican-american family who repeatedly have conversations about only speaking in one language because they typically speak in both. Point is, its a phenomenon and EXTREMELY real. Con eso being said, I hope mi Spanglish turns into Spanish pronto, y en the meanwhile I’m understood. How Do You Measure Net Worth?